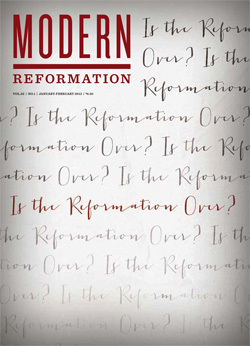 In case you’ve already watched paint dry and shampooed your shoelaces (read: in case you really, legitimately have nothing else to do), feel free to take a sneak peek at my article in the latest Modern Reformation magazine: “Is Evangelical Enough?” It’s a little piece on the influx of young evangelicals converting to Roman Catholicism, the millennials who have dialogued, discussed and dived headlong into the Tiber, attracted to a theology that appears to have the history, orthodoxy and reverence they’ve been missing. As repugnance for the superficial grows among the youth, pop Christianity continues to offer little in the way of help, still struggling to discover where it went wrong. And so the young faithful search for something filling, something profound, something to which their faith can lay hold of and to which it can cling. But their struggle is bigger than the contemporary culture. Their frustration lies in their lack of a past. Protestant churches who have forfeited the Church’s ancient creeds and confessions, liturgies and hymnody, have unwittingly become their own downfalls, producing a generation that longs for—but is not provided with—a theological foundation, a churchly history. ← does fort worth ever cross your mind? It’s not unlike how you see Democrats become Republicans when they start making more money. I’ve had the same conversation with people who became Christians in other denominations, but then joined the Lutheran church once they surveyed everyone’s theology. The more you know, the less likely you are to be in a mega-church. So what about when a so-called Protestant church has NOT lost the creeds, the liturgy, the hymnody, but hangs onto them tenaciously and extols the Christ contained therein? Some people even leave THAT for Rome or the East. Looks like it’s pay per view. If you hold copyright to the article, which I assume you do, can you post it? I’d like to read it, but the site won’t permit beyond the first paragraph without a subscription.